We ended up spending more time in San Diego than we’d expected. Just as we thought we were ready to go we had a minor accident that set us back a few days. We were heading back from the dinghy dock to the boat, when the boat turned suddenly. The jolt knocked our outboard off the transom of the boat, so it was floating in the (salt-)water. Not so good for an outboard. 🙁 We managed to retrieve it within a few seconds and even though no signs of water were evident inside the cowling it certainly wasn’t running right. We found a shop to repair it, but it took almost a week. In the meantime, there’s always more to see and do. We saw a few more military exercises, including some nighttime rebreather diving, where the divers towed flashing disco-ball-like strobes along behind them, Coast Guard helicopter training with rescue divers jumping out and being pulled back in, and Navy dolphin training where the dolphin jumped into their skiff at the end of the day presumably to go back home. Also, it turns out that the America’s Cup has started a new feature, called the World Series, which consists of about a dozen smaller exhibition competitions in various places around the world over the course of the year. 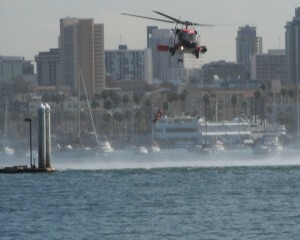 The third one was being held in San Diego while we were there, and it was being held within a half-mile of our anchorage! 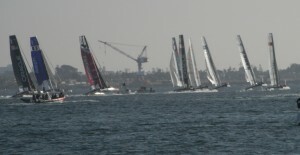 There were seven days of races, some of which came as close as a quarter mile from our boat. There were nine entrants, all of which were sailing 45′ catamarans that had fancy mylar wing-sails. They could get up to 30 knots (~34 mph) and would tip up on one pontoon when they really got moving. It’s pretty impressive! Ailona, a new friend from Portland came down for the week to watch the races and joined us for a couple of days. We finally left San Diego and crossed into Mexico on Wednesday, November 23rd, just in time for my birthday. We had a beautiful overnight sail, arriving in Ensenada mid-morning. We had heard that anchoring in the harbor was not allowed right now because of some construction and dredging going on, but we weren’t exactly sure where we were going. When we pulled into the harbor, we saw a guy on a dock frantically waving and it turned out that he was suggesting that we pull into “his” marina. We anchored briefly in the middle of the harbor and dinghied over to investigate (using our repaired outboard – hooray!). He introduced himself as Chuy, and convinced us that this marina was a good deal. It was a very small marina, and offered us a much lower price than we would have found at a more full-service place. So we went back and retrieved the big boat. We thought we were only going to be there for one night, but it turned out that we were there for three, so it’s a good thing that we found a good price! One must go through customs at the first major harbor that you stop in. Ensenada is one choice, and the next choice was 300 miles away. The advantage to Ensenada is that all of the offices that one must visit, including a bank to pay the fees, are in a single building, rather than being scattered around town. Even so, it took us some significant time on each of three days to get it all taken care of. Instead of tourist cards, we thought we would try to get immigration documentation. We spent the first day tracking that down, but when we found that it would take more than a week we changed our minds. So the second day we got the tourist cards and got the boat “checked in”. This involved a walk to a different bank than the one in the integrated office, because the computer system was down that day. The next day we acquired a Temporary Import Permit for the boat and our belongings, which should help us down the road if we need to purchase repair parts from the U.S. Part of this involved a customs declaration process, and we drew the short straw that entitled us to an inspection of the boat. There’s so much stuff on this boat (from kitchen provisions to tools and spare parts to kayaks and outboard motors) that we were nervous this would be a real pain in the neck! But the customs officer was wonderfully friendly and ended up only doing a very cursory inspection – he didn’t even look in our stateroom. 🙂 We were done in just a few minutes. One other thing we enjoyed about Ensenada was that it was a live enactment of an immersion language lesson. We have a tiny but growing vocabulary and syntax in our brains, and this was a wonderful way to practice and assimilate. Most people speak better English than we do Spanish, so we had a bail-out option nearly everywhere we went. Although they didn’t always understand our attempts, they universally seemed to appreciate the efforts. And we’re having fun figuring out how to conjugate new words and interpret signs that use words we aren’t yet familiar with. The customs officer assured us that we would pick it up quickly. Life in Mexico has, for the time being, become one constant Spanish lesson. We also found a cool device for local use. It’s a product offered by Telcel, a Mexican cell-phone company, that connects to the cell towers and allows your PC to get internet access. It will cost us about $40/month (and $70 up-front to purchase), but we’re both feeling like it’s worth it. It uses USB, so we can move it from one PC to the other easily. The connection seems to be quite good! The next day we left for San Quentin, another 100 miles south. But first we needed to check the boat out of Ensenada with the Port Captain, so back to the integrated office that we were so familiar with. Unfortunately, although the integrated office was open at 10, it turns out that la Officina de la Capitania de Puerto is not open on Saturdays. We debated what to do, and decided to leave anyhow and hope that this is not too major of a misstep when we arrive at our next port. We lost our wind fairly quickly, and ended up motoring most of the way from Ensenada to San Quentin. The sky was very clear, and we were hoping for a sighting of the famed “Green Flash” which neither of us has seen yet. While that did not materialize, we did have a very interesting sunset. After the sun’s orb sank below the surface, the glow continued for a long time, looking like a pool of molten lava. As the sky darkened, the moon became evident and it was a teeny tiny sliver, with a bright planet nearby, probably Venus. The water, although ocean, was glassy smooth much of the night. San Quentin is a wide shallow bay nestled inside a peninsula coming from a piece of land formed by half a dozen volcanic hills. There’s an estuary that continues up from the base of the peninsula, which is apparently an interesting place to explore, but challenging too. The sand bar at the entrance to the estuary is constantly shifting so finding a safe route in is not easy. The water in that area is fairly shallow, so breakers form daily. We anchored in the middle of the bay, away from the areas subject to breakers. The boat is rolling lazily with the swell coming in from the ocean. There are lots of sea lions poking their heads up to see just what we’re doing, and then rolling back over and resuming their lives. Hope all is going well. I’m still working on coming down for a visit. Any more clarity yet on your plans. I think by Februaryish I’ll be ready for a break from Oregon weather.